Hello babes! 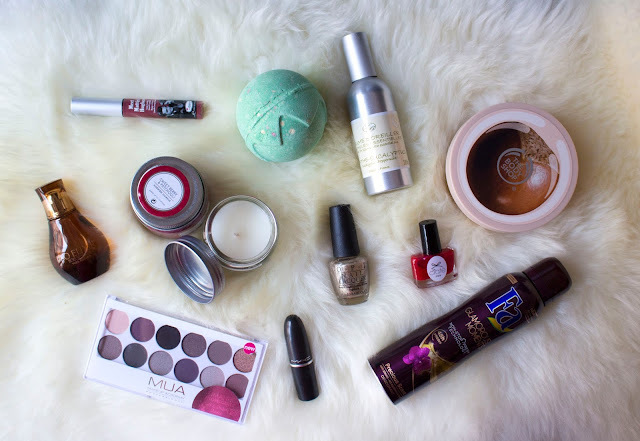 I thought I'd show you some of the products I've been loving this fall! The first thing I've been loving actually inspired this post! This FA deodorant smells amazing, apparently this scent is 'Black Orchids'. I had never smelled anything like it before and it's perfect for fall and winter because it isn't super fresh or light like most FA deodorants. I picked up this Yves Rocher perfume recently with the -50% sale. As I have mentioned before, get a discount card at this store because it will help you save so much money! I never pay full price there. This perfume has wood notes, patchouli & vanilla, which makes it a perfect dreamy, deep scent for fall. I didn't have any fall themed candles besides an old Spaas one (vanilla cookies) so I decided I'd get some cute little ones from primark. These are great and super cheap! The scents I have are Winter Berry and Sweet Berry & Patchouli. I love switching between candles for some variety! This room and pillow spray was actually a birthday present and I've been loving it all year but I've noticed the mint in this spray reminds me of the mint tea I love to drink on cold days. It just makes my bed smell super cosy but still fresh! These two colours are already a bit christmas themed but I can't help myself! I'm really looking forward to winter! OPI is by far my favorite nail polish brand because it barely chips. Ciaté is a brand I've discovered with a beauty box and I love how bright and beautiful their colours are. This is my newest addition to the MAC lipstick family, Verve! I was looking for a great fall and winter colour and I found it. This is beautiful on fair skin but probably also on darker skin. 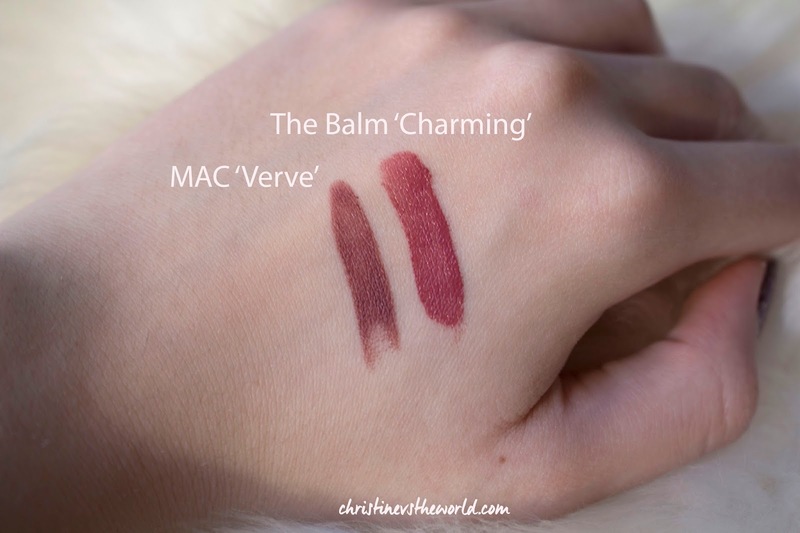 The finish is satin and the colour is described as a 'muted brownish-plum' on the MAC website. I use the lipliner Plum with this one. I didn't use a lipliner on the photo so you could see the colour on its own. This was the first liquid lipstick I tried and now I'm addicted to them. These lipsticks have a mint scent and flavour and tingle on the lips. I like this but I know some people won't. I actually wore this colour in THIS instagram pic! I actually got this palette for free at Kruidvat because there was a deal. I love these colours because there's a little bit of everything (pink, smokey, bronze,..) but they still go together really well. Some of the colours are matte, some are shimmery which I love! For the price (€5,99) this palette is very pigmented. I asked a girl at my local LUSH to tell me about the winter and halloween collections and she recommended me this bath bomb because of the scent (pinewood, patchouli, vanilla, black pepper oil, gardenia...) but also because it turns red in the bathtub and to be honest after a while it kinda looks like your bathing in a pool of blood (halloween lovers will get why this excites me). If you want to see me review LUSH products, tell me in the comments! I love love love body butters in fall and winter! This body shop one has been my favorite lately. I love the scent but it's not overpowering which I perfect for a body butter. I have very dry skin and during the winter I even suffer from eczema but this doesn't irritate my skin at all! This is the Shea one but I also recommend the cocoa butter or moringa one. Tell me some of your favorite fall products in the comments!